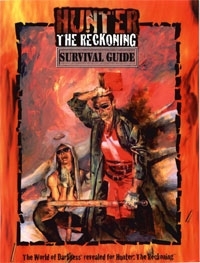 The Hunter Survival Guide is the source on stalking monsters and living to tell the tale. This book updates hunters on their fellows' activities worldwide. It spreads the word about the most dangerous game across the globe, and it offers tips on how to fight and defeat the enemy. Not only is the Survival Guide full of story ideas for any chronicle, it puts hunters on the alert for monsters still at large, perhaps even in your own home town.